Click here for 5 full quotes from Bernie Sanders in the book Outsider in the White House, by Bernie Sanders. 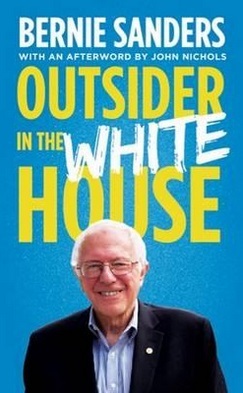 This book is a re-packaging of Sanders' 1997 book, Outsider in the House, with a new introduction and a new afterword written for the September 2015 re-release. Our 2015 excerpts are from the new introduction and a new afterword. The bulk of the book is the same autobiography as the 1997 book -- Bernie's rise to political power through campaigns for Mayor of Burlington and then his election to the U.S. House -- which we discuss in our review of the earlier version -- so we'll focus in this review on the 2016 political campaign. Sanders describes in this book purposes of political campaigns other than winning election -- such as "raising the right issues" and "shifting the framework of the debate." In the 2015-2016 presidential campaign, Sanders has single-handedly created a meaningful Democratic primary, where the "right issues" get discussed because Sanders' candidacy has "shifted the framework of the debate." Party insiders prefer coronations without opposition -- but some say that's bad for both the candidates and the voters. Sanders' presence means Hillary gets to hone her debate skills for the general election, and voters get to see how Hillary responds to challenges from the left. Sanders has accomplished those two things single-handedly: none of the other Democratic contenders were far enough left nor had enough followers. But we predict Sanders will drop out when his delegate numbers become untenable -- shortly after March 15 (details below). In his exit speech, we predict Sanders will claim to have accomplished the challenging task of exposing and altering Hillary's point of view on corporations, on free trade, and on a couple of other issues. But he won�t mention his most important political role: he made Hillary fight for the nomination, which prepares her better for the general election. * PLEOs are Party Leaders and Elected Officials; from the Democratic National Committee or members of Congress, Governors, etc. Obama beat Hillary in the caucuses in 2008 by "community organizing". Can Bernie do the same? No, not this time! Hillary learned her lesson about the caucus process (which are typically one-hour meetings at odd times in odd places like church basements). In the caucus context, "community organizing" means getting the party regulars -- the people who host and attend caucuses -- on your side. We predict Bernie will split all of the caucuses with Hillary, because of Obama's progressive leftovers. But Hillary will win the primaries as overwhelmingly as she did in 2008 -- plus she has all those superdelegates already. We look at the math below using that formula. Hillary won 20 state primaries + 1 state caucus. Obama won 12 state primaries + 17 state caucuses. At that point, the math becomes untenable for Bernie: to make up an 1,100-delegate deficit, he would have win over 80% of the votes in all the remaining contests. We predict that Bernie will withdraw shortly after the March 15 Super Tuesday. The last primary debate is March 9 -- Bernie will participate in that debate, and the primary the week after, and then will declare that his task is completed successfully. Middle class spending $2,200 each to bail out Wall Street. Deregulation led to incredible greed of $39B in CEO bonuses. 1988: NRA opposed Congressional opponents more than him. Predatory lending practices caused 2008 recession.